I am a software and database developer who also has experience in manufacturing especially as a production planner which gives me a good business understanding. While I am mostly employed I also do a small amount of self-employed work for customers. For this I am a Microsoft basic partner. 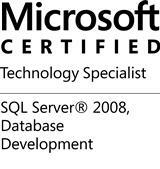 I recently became a MCTS Microsoft Certified Technical Specialist in SQL Server 2008 Database Development.